Connecticut is a small state to be sure but it has been one of the most vigorously independent and productive since Dutch explorer Adriaen Block discovered the Connecticut River in 1614. Geographically, it is the third smallest state, even though its original charter, granted in 1662, extended the land grant west to the Pacific Ocean. And its contributions to the world are great. Three towns in Connecticut developed the first written constitution, "The Fundamental Orders" where it was declared that "the foundation of authority is in the free consent of the people,". The Charter Oak became a symbol of the independence of the people of this state, when King James II revoked the Connecticut Charter in 1687. Preventing Royal Governor Sir Edmund Andros from getting his hands on it, Joseph Wadsworth stole the document and is said to have hidden it in the hollow of an oak tree on Samuel Wylly's property. This state has long been known for its superior productivity from the manufacturing methods developed by Eli Terry and Eli Whitney to the leadership position held today in the production of helicopters, jet aircraft engines, submarines, silverware and small firearms. America's first cigars, man-made combs, factory-made hats, plows, friction matches and the nations first commercial telephone exchange were products of the small state of Connecticut. Connecticut was an established name early in the 1600's in particular reference to the Connecticut River. The word itself was translated from the Indian name "Quinnehtukqut" and means "beside the long tidal river." John Fiske, the historian, claimed that The Fundamental Orders of 1638-39 comprised the first written constitution in history. Though this claim has been disputed by some, it remains a landmark document. It is thought that many of the features of the Federal Constitution were drawn from this document. 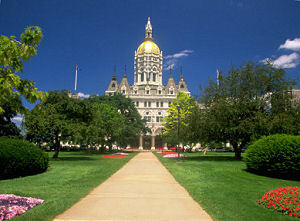 The General Assembly designated Connecticut "The Constitution State" in 1959. Nutmeg, the powder used for seasoning foods, is ground from the seed of the fruit of the Nutmeg Tree, Myristica fragans . A couple of stories exist as to the origin of this nickname. One story has it that this nickname came about as a comment on the ingenuity and shrewdness of the citizens of the state. In a story, perhaps originated by Sam Slick, it is claimed that the people of Connecticut were so ingenious and shrewd that they were able to make and sell "wooden" nutmegs to unsuspecting buyers. A variation on this story maintains that purchasers did not know that the seed must be ground to obtain the spice and may have accused yankee peddlars, unfairly, of selling worthless "wooden" nutmegs. It may be that these wooden nutmegs were whittled by idle sailors on ships coming from the spice island and sold as souvenirs. This nickname was a result of the notoriety propagated by the first government of New Haven Plantation's "Blue Laws." Blue Laws are laws that regulate public morality. Some contend that these Blue Laws were so-named because they were written on blue paper or bound in blue books. Others contend that there is no real evidence that any of these so-called Blue Laws were ever codified. Being that as it may, the stories surrounding the Blue Laws of Connecticut earned the state this nickname. Connecticut was once famous for its Brownstone Quarries at Portland. Brownstone was used to build mansions and public buildings. In the 1800s, the quarry employed 1,500 men from Sweden, Ireland and Italy and operated a fleet of 25 ships to transport the stone down the Connecticut River to Boston, New York, Philadelphia, San Francisco and London. In May, 2000, 51 acres that comprise the town-owned Portland Brownstone Quarries were named a National Historic Landmark by the Department of the Interior. This nickname was applied because of the formerly valuable freestone (sandstone) quarries in the state of Connecticut. This nickname originated during the Revolutionary War when Connecticut provided most of the food and canons to the forces. This nickname came about because of the strict morals of the people of the state. A Dictionary of Americanisms on Historical Principles , edited by Mitford M. Mathews (Chicago: University of Chicago Press, 1951) defines "Land of Steady Habits" as "1. Connecticut, applied in allusion to the strict morals of its inhabitants," (page 954). People who live in Connecticut or who come from Connecticut are called Connecticuters. In 1702, Cotton Mather referred to Connecticuters as Connecticotians. 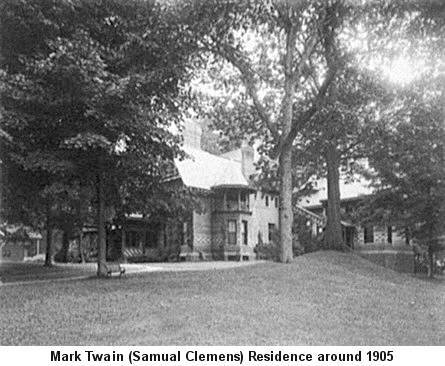 Samual Peters referred to Connecticutensians. Nicknames for Connecticuters include Nutmegs or Nutmeggers. The last commemorative quarter minted in 1999, was for the small New England state of Connecticut. The fifth state to join the union, the Constitution State may be small, but . . . The design of the Connecticut State Quarter depicts Samuel Wylly's oak tree, "The Charter Oak". Perhaps only Captain Wadsworth really knew what happened Halloween night, 1687. For more about the state commemorative quarters, visit this page. This 50 State Quarter Map is a great way to collect and display all 50 State Quarters. Carpenter, Allan & Provose, Carl. The World Almanac® of the U.S.A. . World Almanac Books (An Imprint of K-III Reference Corporation, A K-III Communications Company). Mahwah, N.J., 1996. Shankle, George Earlie. State Names, Flags, Seals, Songs, Birds, Flowers, and Other Symbols . Irvine, Calif.: Reprint Services Corp, Revised edition, 1971. The True-blue laws of Connecticut and New Haven : and the false blue-laws invented by the Rev. Samuel Peters: Edited by J. Hammond Trumbull, Hartford, Conn. American Pub. Co., 1876. Digitized by the Arnold Bernhard Library, Quinnipiac University, March, 2004. Imaging and text conversion done by Carly Nartowicz, final layout by Terry Ballard, Automation Librarian. Connecticut (From Sea to Shining Sea) , by Nancy Furstinger. 80 pages. Publisher: Scholastic Library Publishing (September 2002) Reading level: Grades 3-5. Presents information about Connecticut's people, geography, history, landmarks, natural resources, government, state capitol, towns and cities, and more. Connecticut (World Almanac Library of the States) , by Darice Bailer. 48 pages. Gareth Stevens Publishing (July 2002) Reading level: Grades 4-6. Filled with the most up-to-date information, including the latest Census results. Full-color photos bring to life the story of Connecticut. In addition to an in-depth factual profile of Connecticut in the form of a state Almanac, this book offers fascinating and lively discussions of the state's history, people, geography, government, economy, culture, and lifestyles. A section on Notable People, a calendar of events, and enough primary source documents, time lines, maps, and other tools to make this unquestionably the best young adult reference material on the USA available anywhere. It Happened in Connecticut , by Diana Ross McCain. 168 pages. Globe Pequot; 1st edition (July 17, 2008) From a hostile takeover, colonial style, to the first lady governor who was never a governor's lady, It Happened in Connecticut tells the stories of intriguing people and events from the history of the Nutmeg State. Find out where that dubious Nutmegger nickname originated. 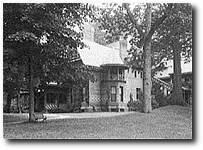 Discover what a Windsor boardinghouse owner did to inspire the dark comedy Arsenic and Old Lace. And be inspired by Abby Smith and her cows--a roller coaster ride of a story from the early days of the women's suffrage movement. Connecticut Icons: 50 Symbols of the Nutmeg State , by Charles Monagan. 112 pages. Globe Pequot; 1st edition (November 1, 2006) Charles Monagan knows Connecticut. As editor of Connecticut Magazine he has spent years discovering and describing the people, places, and things that comprise the character of his home state. With this entertaining collection of photos, anecdotes, and little-known facts, Monagan presents fifty of his favorite icons from the hot lobster roll to the Yale Bowl, the U.S.S. Nautilus to the Merritt Parkway and shows native and newcomer alike the independent spirit and local pride at the heart of this great state of Connecticut.